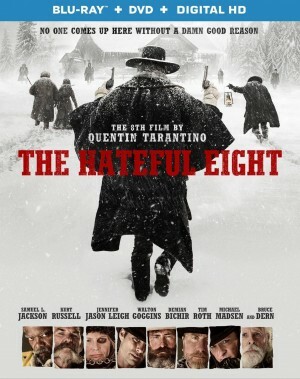 THE HATEFUL EIGHT. (DVD Artwork). ©The Weinstein Company. Anchor Bay Entertainment and The Weinstein Company present the home entertainment release of the eighth film by two-time Academy Award winner Quentin Tarantino (“Django Unchained”, “Pulp Fiction”). Shot entirely on 70mm and featuring an Academy Award-winning score by prolific composer Ennio Morricone (“Bugsy,” “The Mission”) “The Hateful Eight” delves into an explosive frontier mystery about eight strangers with one deadly connection. The film stars Kurt Russell as bounty hunter John Ruth who is bringing fugitive Daisy Domergue (Jennifer Jason Leigh) across the frontier to justice. Along the road, they encounter Major Marquis Warren (Samuel L. Jackson), a former union soldier turned bounty hunter, and Chris Mannix (Walton Googins), a southern renegade who claims to be the town’s new sheriff. Losing their lead on the blizzard, the strangers seek refuge at Minnie’s Haberdashery, a stagecoach stopover on a mountain pass. When they arrive, they are greeted by four unfamiliar faces: Bob (Demian Bichir), who’s taking care of Minnie’s place while she’s away, along with Oswaldo Mobray (Tim Roth), the hangman Ruth plans to deliver Daisy to, cow-puncher Joe Gage (Michael Madsen) and Confederate General Sanford Smithers (Bruce Dern). As the storm overtakes the mountainside stopover, the eight travelers come to learn they may not ever make it to Red Rock. Ultra Panavision 70 is the very rare and exceptional format that Tarantino and his team used to shoot “The Hateful Eight.” It is the widest 70mm theatrical release in 20 years. Panavision’s anamorphic camera lenses capture images on film in an incredible aspect ratio of 2.76:1, which provides wider and more detailed images than most films shot today. The film also is available on Digital HD. William Hurt and Tom Goodman star in “Humans,” the uncut U.K. edition of AMC’s hit sci-fi series, which is available on DVD and Blu-ray Tuesday, March 29. In the near future, humanoid servants called synthetics—or synths—have been created to help busy families simplify their lives. But it’s uncertain (and unlikely) that these perfect servants will stay compliant forever. 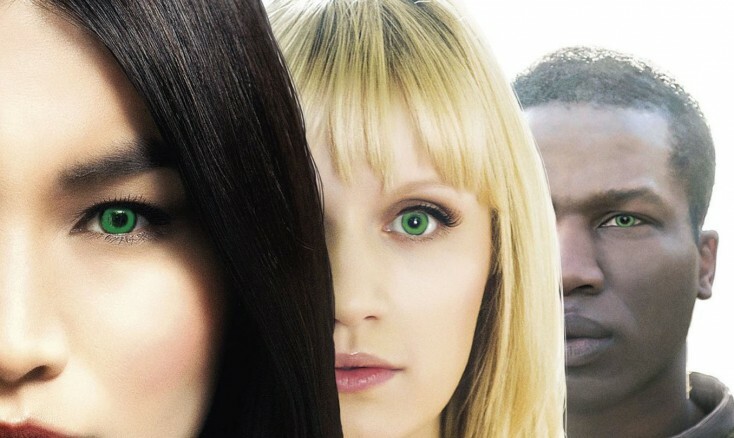 When Joe Hawkins (Tom Goodman-Hill, “The Imitation Game”) buys synth Anita (Gemma Chan, “Jack Ryan: Shadow Recruit”), he hopes it will relieve the pressure on his lawyer wife, Laura (Katherine Parkinson, “The IT Crowd”). Although Anita is a hit with Joe’s young children, Laura feels uneasy about sharing her home with a synth. Meanwhile, retired synth engineer George (Hurt, “A History of Violence”) refuses to dispose of his beloved but malfunctioning synth, Odi (Will Tudor, “Game of Thrones”). And mysterious Leo (Colin Morgan, “Merlin”) hides secrets that could transform the future of synth technology. The 3-disc DVD 3-set, and the two-disc Blu-ray set contain all 11 episodes, and are available for $39.99 each.